If you are like me, you have probably seen one of these beautiful silver dogs with their unique blue eyes and wondered what is the Weimaraner temperament like? Bred originally in Germany to be used by royalty as hunting dogs, the Weimaraner is still somewhat of a rarity in the United States. Also known as Germany’s Gray Ghost, the Weimaraner is beloved as a hunting dog and as a family companion. Their striking physical features make them stand out in any crowd. They recently gained greater exposure thanks to the artistic portraits by photographer William Wegman. Weimaraner Life Span: Weimaraners live to be about 10 to 12 years old, though they have been known to live as long as 17 years. Weimaraner Colors: These dogs come in three shades of gray: Silver, Silver-gray, and Mouse-gray. No other colors are accepted. Weimaraner Height: Female Weimaraners usually mature to between 23–25 inches, while the males top out at about 24–26 inches. Weimaraner Weight: Weimaraner size is fairly large. These big dogs can weigh between 55 and 88 pounds. The Weimaraner originated in the town of Weimar, Germany. The breed originally hunted large game such as bears, wolves and mountain lions. As these large predators declined in Europe, the Weim adapted to hunt rabbits and birds. What’s to love about the Weimaraner temperament? 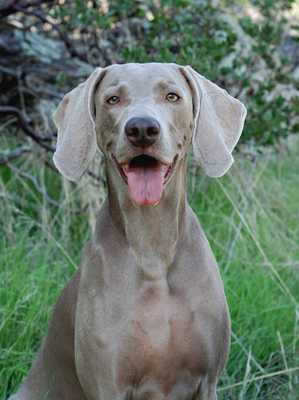 As a hunting dog, the Weimaraner has a lot to offer, even if you never take him out in the field in search of rabbits. When looking into the Weimaraner temperament, one of the first things you will notice is his fairly high mental aptitude. These dogs are extremely smart and in fact rank in the top 25 of all breeds when it comes to intelligence. This sort of intellect can be a challenge for many owners, so be sure you are up to outsmarting your dog if you take on a Weimaraner! You will need to keep him occupied with plenty of toys and enrichment items. These dogs need patient but consistent training beyond just the basics. As many hunting breeds are, the Weimaraner is very loyal. This comes from generations of bird dogs who had to be trusted to not only go out and find game, but to come back to their beloved masters. This side of the Weimaraners' temperament makes them wonderful pets as well as great watchdogs. Most Weimaraners will instinctively protect their home and family. As a loyal member of the family, Weimaraners can be gentle and loving even with the youngest members. However, without a lot of physical exercise these dogs can become very rambunctious. Their high energy playfulness can be a lot of fun under the right circumstances, but if they are cooped up too much, they may become too rowdy to play with the kids. 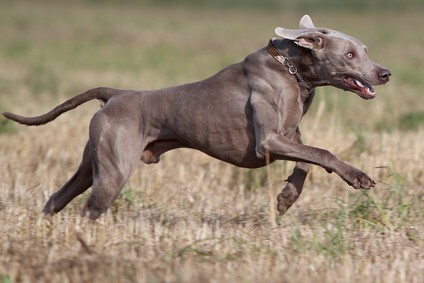 This is why Weimaraner exercise is crucial to success with this breed! Be sure to supervise young children when they interact with dogs of any breed. Do you enjoy an active lifestyle? Are you looking for a companion to motivate you to go for morning jogs? If so, a Weimaraner will make an excellent workout buddy. Weimaraners are very athletic. They need plenty of daily exercises. If you are an active, outdoorsy person, a Weimaraner will be a perfect match for you. However, if you are more of a couch potato, this lively dog will not be a good fit for your lifestyle. What’s not so great about the Weimaraner? They are beautiful, brilliant and loyal, so what’s not to love about the Weimaraner temperament? Do you know those dogs in movies that chew through everything and dig through walls when their owner leaves them alone for even a few hours? That sort of bad behavior is not all that uncommon for the Weimaraner. A bored or lonely Weimaraner will bark loudly and incessantly, wreak havoc in your home and yard, and do whatever they can to escape. This sort of destructive behavior can be avoided if they are given enough exercise and mental stimulation to keep that bright brain of theirs from thinking up ways to entertain itself. If your Weimaraner suffers from bad anxiety, you might need to bring your dog to doggie daycare during the workday or hire a dog walker to stop by and check on him. If the anxiety becomes severe, seek advice from your veterinarian and a professional trainer. The Weimaraner’s temperament can lead to aggressive behavior with other dogs and their highly acute hunting instinct makes them dangerous around small pets. If you want to bring a Weimaraner into a home with other pets, it is imperative that you spend a lot of time training and socializing your puppy as to the proper way to behave. Use treats to form a positive association with other animals. Always supervise your Weim’s interactions with other dogs and cats. If you need to leave them unsupervised, separate them into different rooms of the house or place your Weimaraner in his crate. Weimaraners like to bark… A lot!! Again, this sort of behavior problem can be averted with plenty of exercise and interaction. Do not pay attention to your dog when he barks for attention. Instead, ignore him until he is calm and quiet. Training your Weimaraner can be a fun and rewarding process. Sign up for a class with a positive reinforcement trainer at your earliest opportunity. Avoid trainers that use forceful methods or painful tools such as pinch collars and shock collars. Positive reinforcement training will strengthen your bond with your Weimaraner. Obedience training is also a great way to keep your Weim mentally engaged. Weimaraners love to learn new things throughout their lives. After you master basic obedience, you can explore canine sports such as Nosework, Agility, Search and Rescue, Rally Obedience, and much more! For help with training your Weimaraner take a look at The Online Dog Trainer by Doggy Dan. Doggy Dan is an expert Dog Trainer based in New Zealand. His online resource contains Hundreds of Excellent Dog Training Videos that will take you step-by-step through the process of developing a healthy, happy well-behaved dog. Though many Weimaraner owners enjoy a long relationship with their dog with few major health problems, there are a few issues that are common for this breed. Be sure to discuss these health concerns with your veterinarian before bringing home a Weimaraner. Also known as “bloat” this painful affliction is caused by eating large meals too quickly. Big dogs like Weimaraners tend to gulp large amounts of food or water at once causing their stomach to swell. The best way to avoid this is to serve your dog several smaller meals throughout the day. You can also purchase a slow-feed bowl or a puzzle feeder to make your Weimaraner slow down while he is eating his meals. Bloat is extremely dangerous. If you observe symptoms of bloat, rush your dog to an emergency veterinarian right away for corrective surgery. This degenerative joint disease is common in Weimaraners and can be quite painful. Though hereditary, a good quality diet and exercise can help keep symptoms at bay. Joint supplements such as Glucosamine can help the joints stay healthy for longer. Also keeping your Weimaraner at a healthy weight will help avoid too much pressure on the joints. Weimaraners that become obese often have more difficulty with their hips. Like all dogs, your Weimaraner should visit the veterinarian once per year for a physical check-up and annual vaccinations. Your Weimaraner should stay up to date on heartworm prevention and flea/tick prevention at all times. Spaying and neutering is highly recommended. Note: Our Health is #1 Priority. It should be no different or your Weimaraner. But you need to help him. The Ultimate Guide to Dog Health is the answer. This handy guide will help you recognize the symptoms of the health problems above. Get the knowledge to stay ahead of these terrible issues that can rob your lovely Affe from vigor and life. Help your friend make it to 14 yrs+ without pain and suffering. Grooming your Weimaraner is a very easy task. The Weim’s short coat is extremely low-maintenance. Occasional brushing and bathing will suffice. Shedding is minimal with this breed. However, the fur is not considered hypoallergenic. You should also make sure to brush your dog’s teeth, clean his ears and trim his toenails on a regular basis. If you would like to add a Weimaraner to your home, please look into rescue and adoption options first. There are already so many homeless animals in this country. You may find that a rescued Weimaraner is the perfect addition to your family. You can search for Weimaraner rescue groups through Google and Facebook. You may want to broaden your search to Sporting Dog rescue groups for more options. Most of the Weimaraners in rescue groups are there through no fault of their own. Sometimes owners must rehome their dogs due to personal crises such as moving, divorce, illness, etc. The majority of the Weimaraners in rescue are adult or older dogs, although puppies sometimes become available as well. Adopting an older dog can be a very rewarding experience. 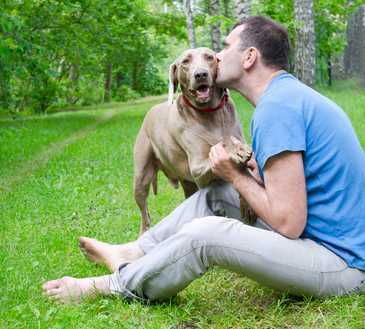 Older dogs are calmer and they do not require as much exercise, training or attention as a puppy. Their personalities are more stable, so you will have a better idea of what you are bringing home. Many adoptable Weimaraners are in foster homes, so the foster families can give you excellent information and advice for helping your new dog settle into its home. There are many helpful websites for finding a Weimaraner for adoption. 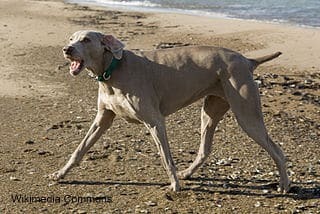 Visit Petfinder.com, Adoptapet.com, and Getyourpet.com to search for adoptable Weimaraners in your geographic area. Do not forget to stop by your local animal shelter as well. Ask to fill out an application to be notified when Weimaraners become available for adoption. If you choose to acquire your Weimaraner through adoption, the adoption fee will probably be between $75 and $300 depending on the organization. Almost all adopted Weimaraners will come already spayed/neutered, vaccinated and vetted. If you decide to look for a Weimaraner breeder, a good place to start your search is with the Weimaraner Club of America. Although the Weimaraner Club of America does not endorse specific breeders, they do have a list of resources for finding ethical, responsible breeders. It is up to you to do diligent research to make sure you are acquiring your puppy from a reputable source. Never purchase a Weimaraner puppy over the internet or from a pet store. Responsible breeders do not sell puppies this way. If you acquire a puppy in this manner, you are most likely buying a puppy from a puppy mill or backyard breeder. Contact the local Weimaraner club in your region and ask for a list of top Weimaraner breeders. Set appointments to visit the breeders in person. Ask to view the premises, meet the breeding dogs, and see medical records. The breeder should welcome your visit. They will want a chance to get to know you, too! A good breeder will ask you questions to make sure you can provide a suitable home. They will ask you to return the puppy to them if things do not work out. A good breeder never wants their dogs to end up homeless. If the breeder does not want you to visit the property and/or does not ask you any questions, this is a bad sign. Keep looking for other options. When you purchase a Weimaraner for sale through a high-quality breeder, the Weimaraner price will be somewhere between $700 and $1400 depending on the breeder. However, certain bloodlines will be even more expensive. In the right hands and with the right kind of training, they are wonderful family pets. Without a lot of attention and interaction, however, the sensitive and intense Weimaraner temperament can get out of control. Make sure to take your time and do your research to decide if a “gray ghost” will make a good addition to your lifestyle. Talk with experienced owners and breeders about Weimaraner traits (both good and bad!) to make sure you are ready for a lifetime commitment.